I should seriously already be asleep right now because I’m anticipating getting up at 4:30 am, and not only that, but will be running about 12 miles. So why I’m not sleeping right not is surely some kind of masochism on my part, but I really wanted to post this a little early because Saturdays seem to be crazy days for me to post. I never get to post as early as I want to for whatever reason. Mostly cause my kids are usually anticipating waffles or some kind of yummy breakfast and so yeah, I’ll just post this early. I love how quick and easy this is and it only requires a few ingredients. One of which being your favorite barbecue sauce. If you don’t have a favorite, then use mine. It’s this. Famous Dave’s Rich & Sassy BBQ Sauce. Yum!! This will take any recipe up to the next level. It is amazing!! Enjoy! P.S. I bought this cute little calzone maker this week, so I’ll have pictures demonstrating steps with and without it, but don’t feel like you have to have one to make these. I just had to have an excuse to try mine out, but it’s just as easy to make these without one. Unroll pizza dough on clean work surface. Pat out to 15-in x 11-in. rectangle; cut lengthwise in half, then cut each piece crosswise into thirds. 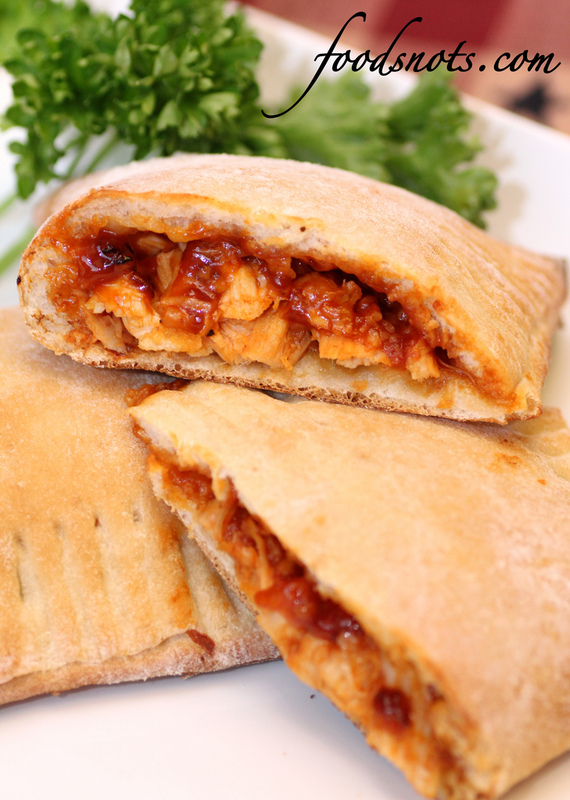 Top dough rectangles with 1 tablespoons barbecue sauce. Layer 1 tablespoon mozzarella, about 1/4 cup shredded chicken (really loosely packed), 1 1/2 tablespoons chopped onion, and 1 tablespoon Romano cheese. Drizzle 1 tablespoon barbecue over filling and fold in half. Seal edges with fork. If needed, dampen edges with water to make them stick together. Place on baking sheet sprayed with cooking spray.